A couple of friends mentioned the Apple Airport Express to me and it sounded compelling; a super compact 802.11n Wi-Fi base station that could not only serve as a wireless USB print server but could also be used to play my iTunes music on my stereo. I have long wanted a clean solution for accessing my iTunes collection from my stereo without a big hassle and this sounded perfect. I bought one on Amazon.com for $96 and used my Amazon Prime account to get it here in two days. 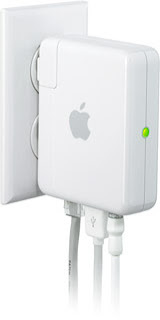 The AirPort Express itself is extremely small; about the size of a standard MacBook power adapter. There were instructions inside and a CD containing the AirPort Utility but since I had already installed a Time Capsule I had all of the software ready to go. I simply plugged the AirPort Express into a power outlet inside of our stereo cabinet and ran a mini-stereo to RCA cable from it into one of the inputs on our main stereo receiver. A small green light started to flash so I went over to my MacBook Pro and fired up the AirPort Utility. There was a new wireless network that I could join so I switched to it and found the new device. So far, so good. The AirPort Utility walked me through a series of questions to configure the device and the next thing I knew it was attached to my existing wireless network and was visible to all of the machines on my network. It could not have been any easier. I ran downstairs and fired up iTunes on my Mac Pro, where my main music collection resides. Down in the lower right corner of the iTunes window I noticed that I now had a pop-up menu that would allow me to target either my Computer or the cleverly named "David Alison's AirPort Express" for sound output. By selecting the AirPort Express anything I played through iTunes would get pushed out to my stereo now. I had to play with the volume both on iTunes and at the stereo to eliminate some static issues but was able to resolve that pretty quickly. This was great—my entire music collection was now easily accessable inside of our family room! About the only problem with all of this was that since my music collection was downstairs on my Mac Pro I would have to run downstairs if I wanted to select a different song or play list. Enter the free Remote application for the iPhone and iPod Touch. This Wi-Fi based application loads up on your iPhone and allows you to remotely control iTunes running on your Mac. You simply pair it up and you can control the operation of iTunes right from your iPhone. You can see your album artwork directly on your iPhone too; very cool. "David, this is really cool. Can you put that on MY iPhone and hook it up to MY MacBook? I want to listen to MY music!" Great. I set up the coolest toy I've seen in a while and before I could play a single song all the way through she had claimed the set up as her own. Sure, we have some overlap in our musical tastes but she doesn't care to listen to my 80s rock and I feel the bile rise when some of the "crooners" she likes start belting out their songs. I quickly got her MacBook and iPhone matched up, then walked away as my shiny new AirPort Express was being used to push Michael Bublé's "Save the last dance for me" out of our stereo speakers. Oh well, it was great while it lasted. On the bright side my wife is extremely happy. Got a different way to play your digital music throughout your house? As Roland Orzabal would say, Shout, Shout, let it all out... in the comments. If you come and set this up at my house I'll let you listen to 80's rock. We never figured out how to pipe music throughout our house. It's for the best though. No kids and it's easy for one of us to be upstairs listening to one thing and someone downstairs listening to something else. What we did do though was this: I digitized all of our CDs, put the music on my spouse's computer, and bought an IR USB remote. We could now navigate the screen and do all basic stereo functions from the remote. Still, it's hard to see what you're doing with the cursor from across the room. So using the API of our media player (Media Monkey, an iTunes competitor) I made a full-screen high-contrast UI so we could use the remote to navigate much like you use your iPhone. 1) You shouldn't have gotten that MacBook for your wife after all. 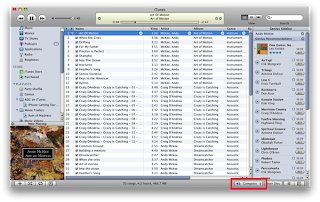 My iTunes folder is not part of my Time Machine backups. Instead I use iBackup to sync the music directory to my Time Capsule. That way I have access to it from my XP work laptop when I'm "at work" in my office area (working from home rocks). I have a receiver/amp and speakers in my office area upstairs for listening. I just imported all the mp3s on the Time Capsule into Windows Media Player because I'm wary of pointing a different iTunes at the backup directory. I also kept the directory read only for the account I use to get to it. I'd use the iTunes sharing from my Mac, but it doesn't work when I'm on the VPN with my work laptop. I can get to a local file share, though, so that's what I have to use. Most of the time, though, I just load up my iPod Nano with a selection of my music and listen to that throughout the day. It lasts about 2 weeks before I run out, so that's plenty long enough. I use an Airport Express connection plugged directly into powered speakers, but without a router-- the AE does 802.11 streaming just fine. And, using Airfoil from Rogue Amoeba, it doesn't have to be from iTunes-- I can stream music into the speakers from Pandora or any other source. Oh, I forgot to mention my JVC receiver came with a USB transmitter. I can plug it into a computer and use that transmitter as the sound device. The stereo has a small antenna in the back to receive the stream to play. It doesn't have a very long range (seems about the same as bluetooth), but since that stereo is just on the other side of a wall from my computer setup, that works for me. I only listen to either Vinyl records or MP3's streamed though the airport express. My Turntable (Stanton T-90) has a USB port directly on it so I can Rip Vinyl direct to the Macbook Pro. It's really good fun and I've got the best of both worlds and have completely eliminated CD's from my life. To be honest I only really use the airport express to fill in the gaps in the time it takes to change sides on the LP! Bought a Wii for my son with the intended dual purpose of using it as a media center for myself. Have it hooked up to the wireless network and have Orb installed on my XP VM on my MacBook. I use Orb through the Opera browser on the Wii to stream not only all of my music through my TV/Entertainment System, but all of my pictures, video and movies as well. It's all coming from my external drive plugged in to my MacBook. This setup works great and was as low cost as you can get (since I was already getting the Wii for the kids). 802.11n is a must though. What I'm really waiting for is Orb to get approval from Apple to be put on the AppStore and use it to stream everything to my iPhone, including live TV. It IS availble right now on jailbroken 1.1.x iPhones, but waiting for official approval for 2.x. Live TV on my iPhone.....awesome. The iphone remote application really makes this set up. I have my Airport Express plugged into a set of AudioEngine 5s (audioengineusa.com), a powered speaker with a plug and audio input in the back of the main speaker. Very clean install with no visable wires. You could add a second set of speakers in another room and have even greater control over your music. One handy thing to know about the Airport Express and iTunes is that it can output to multiple sources at the same time, keeping the audio in sync between them all. I've used two Airport Expresses, and the speakers hooked to my Mac to have 3 different areas of my house playing the exact same music. Also, I used to use the AE and a set of USB powered speakers like these to have music outside. The speakers draw power from a USB port, but still have an 1/8th inch audio jack for the actual audio source. Plug in the USB port to the AE as well as the audio, and you have an instant wireless music setup that only requires one power plug. I love my Airport Express David! I just bought a 2nd one this last weekend (the old one is a b/g) at the same time as I bought a replacement "n" card for my 1st gen MacBook Pro. The original one went into my bedroom with that stereo, and I know have 3 zones (Office with computer, living room, bed room). David, I would encourage you, if your stereo has digital inputs, to go with an optical cable from the AEX to the stereo. Although the D>A in the AEX works, it is really not in the same league as most stereo D>As. iTunes will send the audio, lossless (no ADDITIONAL loss over the file being streamed anyway, so if you stream ALAC or WAV it will send that raw file, compressed using ALAC, and then expanded at the other end) through the optical cable straight into your stereo - as if you plugged the optical cable right into the back of your Mac. This produces MUCH better audio quality than using an mini>RCA cable. Another thing that is great about the AEX is its portability and its ability to save up to 5 custom settings. Whenever I go on a trip, it allows me to make wherever I am a wireless station, and if it has any kind of music device, allows me to stream my iTunes to it. Lastly, as was mentioned here. Airfoil is a MUST for streaming ANY audio to the AEX. I have used a similar setup at home for several years. Unfortunately I can't afford an iPhone/iPod Touch to act as the remote, but I was using an old ThinkPad T20 upstairs to share the music from my G5 downstairs and send it to the stereo upstairs (a nice pair of Paradigms finishing out the link - derned nice bookshelf speakers). Once I got this setup working I was content to state that I was finally living in the future. Unfortunately my thinkpad has given up the ghost and I'm stuck just plugging in my iPod upstairs for the time being. Okay, yeah that looks like a pretty cool bit of kit which would almost justify a Touch or iPhone. However I could see the exact same scenario playing out in my house, and in fact as I was reading it I pretty much figured out that was going to happen. My musical tastes fall pretty much into your '80s rock (Alternative and imports, actually) and my wife's one 'crooner' would be Elvis Presley. If I got one of these setups it would be hijacked and there would be nothing but 'Welcome to my World', 'See See Rider', and 'Viva Las Vegas' 24/7. Fortunately I have a pretty good set of speakers hooked up to my Macbook. I use "Rivet" on my MacPro to serve all my audio files, photos and videos/movies to my Xbox360 on another floor. My Xbox360 is hooked up to my stereo and HDTV so this makes playing tunes (with or without the funky music visualizations) a breeze. They Say you win some and you lose some. When you are The Son/Husband/Dad, you lose em all. UPDATE: My wife is apparently very fond of boy bands, as evidenced by the sound blasting through our stereo upstairs. I think our AirPort Express is about to experience catastrophic technical problems. If you played Tears for Fears in my house I'd take it over too. You and Brad must share music. Before I found your blog, I had scheduled a Personal Shopping session at the nearby Apple Store for this (Saturday) morning. And although your computer experience far exceeds mine, reading some of your beginning episodes (on the Mac) gives me hope as to my own learning curve if/when I make the plunge. It has definitely shaped my understanding and questions that I should ask. @Kyle: So glad to hear that man - this is one of the big motivations for me to write this all down. David -- You have excellent taste in music, Andy Mckee is one of the most amazing young talents. @Rick: Thanks - Andy McKee, Don Ross, Andy Fox, Craig D'Andrea - some of my favorite artists. I buy a lot of that music from Candy Rat Records; lots of great stuff there. @David -- yes, I have pretty much everything from Candy Rat. Antione Dufor is on the top of the playlist right now. Also you might try Preston Reed, Billy McLaughlin, and of course Michael Hedges if you have not done so before. Thanks for the great BLOG, I recently talked my boss into buying a MacBook Pro to replace my MacBook Black, and could not be more happy. Also if you just want a second set of speakers -- I am going to try these with an Airport Express. They have a built in power outlet for the express, and a USB charging port. @Rick - great stuff. Thanks! I just picked one up at the Fair Oaks store and was wondering how you have it plugged in - as in into the wall, or a power strip. If in a power strip is it then flipped 90 degrees to face the floor? Basically, what I'm after, is is the antenna polarized? @Trisha: I believe it's omnidirectional though the signal I get from it is somewhat limited compared to the Time Capsule I normally get my wireless connectivity from. I have mine plugged into a small extension cord which is then plugged in to a power strip in my entertainment center. All I really need it to do is punch through a single wall to get to the Time Capsule so it hasn't been an issue for me. Good luck!